Gerard did the unthinkable and I cried like a big fat baby. If you follow us on social media, you probably already know. Gerard did the unthinkable, got down on one knee (seriously!) 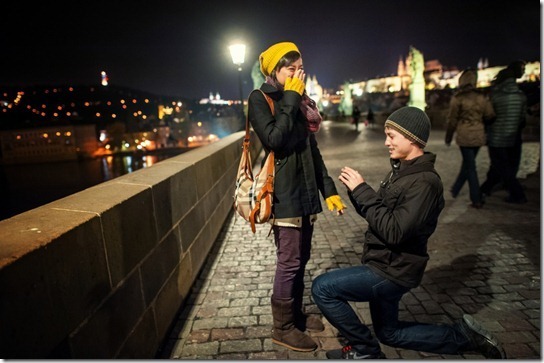 and proposed to me on the Charles Bridge in Prague last week! It’s official..
Gerard and I met almost 10 years ago through a mutual friend at a club. Classy, I know. Trust me, neither of us planned on it, a serious relationship, I had just returned from a semester abroad and Gerard just came out of a crazy relationship. Fate had other plans I guess. For the longest time, Q has been telling me how much she wants to visit Prague, it’s one of the most romantic cities in Europe, she’d say, or so she’s heard from countless others. So when we decided to visit Europe for the winter, I knew this would be the perfect opportunity to propose. Even though we don’t talk about “it”, as cheesy as it sounds, I’ve always known Q was the one. I’ve been ready, just waiting for the perfect timing I guess. The moment I decided Prague would be the place, I knew how I’d do it too. Nothing fancy but I wanted to make sure we’d capture the moment so I scoured the internet to find a local photographer and came across Jan. In short, the plan was to do some night photography on the Charles Bridge and I’d casually ask Jan, who would pose as a tourist, to take our picture. Then I’d get on my knee, say my speech, she’d replied yes (hopefully)! – my bullet proof plan. Or so I thought. That night, dinner ran late causing us to run behind schedule. Not a good start at all. I was a ball of nerves, worried she’d notice the ring box bulging in my jacket pocket. She certainly noticed my sweaty palms during dinner, that’s for sure. Once on the bridge, I spotted Jan almost immediately with his blue puffy jacket. I suggested we take a picture together and casually ask if Jan would do it. As planned, he took a few pictures, said the photos weren’t coming out clear and offered to take our pictures with his camera and email us later. This was us before the proposal. She had no idea..
Jan’s cue to me was asking us to try a romantic pose. After an awkward look to each other, I reached for Q’s hand, begin to slowly get down on one knee and.. Q started to cry hysterically before I could get a word out. Still on my knees, a couple of tourists walked by screaming “Congratulations!”, but I yelled back… “She HASN’T said YES yet!”. Q followed with her own holler which was a big “YESSSS!” so everyone could hear loud and clear. Where do I even begin? I should have known! Not really.. I mean, I know it’s hard to believe, but it’s not something we’ve ever discussed before, our “future plans”, even after 8 years of dating. And, since we’ve been traveling non-stop for nearly a year now, where in the world did he find time to plan this or get a ring for that matter?! Looking back at the big day and the days leading up to it, I laugh because some things started to make sense – Gerard trippin’ that I planned a ghost tour the same night which he insisted we reschedule, the rushed dinner where he seemed uneasy with sweaty palms, and NOT ordering dessert after said dinner – that should have been a dead giveaway, he never skips dessert! The photographer, Jan was a decoy hired by Gerard to capture the moment. Smart guy that boyfriend (ahem.. fiancé) of mine. Jan was posing as a tourist on the Charles Bridge – blue puffy jacket, Movember stash with DSL camera minding his own business. Gerard ask if he could take our picture, you know people with big fancy camera, they probably know a thing about taking a good photo. Jan agreed and after two shots, said the pictures were not good but suggested he take it with his camera and email us the photos later. I wanted to thank Jan and leave after a few shots. It was getting weird because he kept taking pictures and asking us to do “romantic poses”. But then Gerard grabbed my hand, mumbled something about how he loves me and it finally hit me. I started to cry, uncontrollably, ugly face with tears streaming down my cheeks, I could barely make out what Gerard was saying. I remember hearing some tourists in the background yelling, Congratulations!, and all I could muster was a, Seriously?! Realizing that probably wasn’t the right answer, I screamed back a loud YES! to a kneeling Gerard. I finally noticed Jan and remember saying, You!! I can’t believe you were in on this! Afterwards, Jan stuck around and he took a few extra pictures for us while we still had our goofy, giddy, smiley faces on. 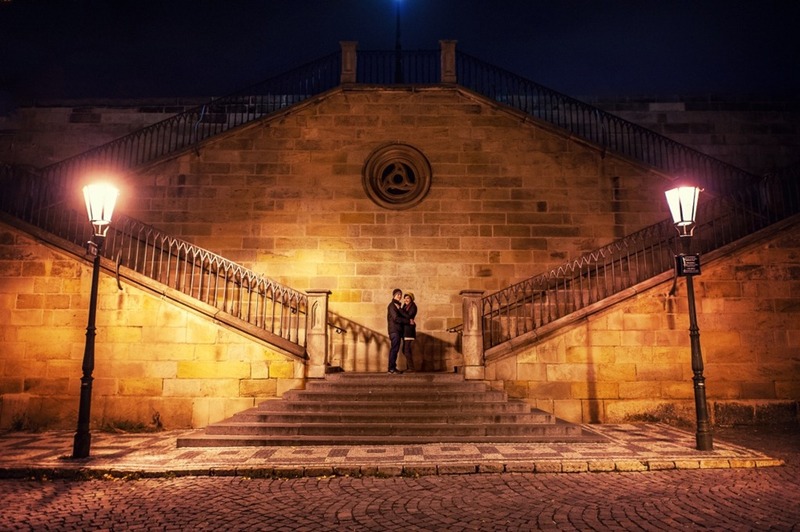 Here is a sneak peak at our engagement in Prague! I truly am THE LUCKIEST GIRL IN THE WORLD! The last 8 years with Gerard has been an incredible adventure and 2012 was nothing short of spectacular – more than I could’ve ever hoped for. Our journey, however, is about to begin. And you know what.. I can’t wait. We want to "Go with Oh" to Prague! This is such an amazing story! 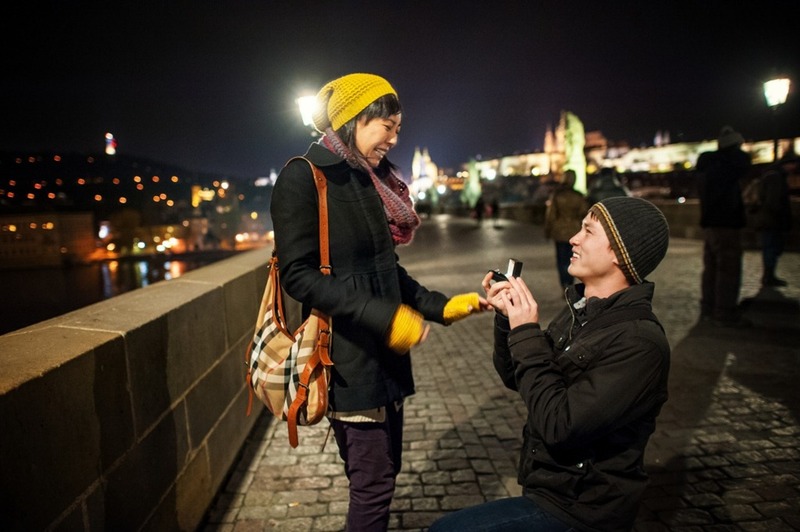 Prague really is one of the most romantic cities – what a perfect proposal! Congrats you two! LOL. Aww, thanks for the congrats and the follow! Simple, sweet, romantic!! I love it! And now Prague will always hold a special place in your life! This brought a tear to my eye!! I’m so happy for you guys! G, you are one slick guy! Such a great love story! Congraulations you two! Awww i LOVE the his & hers stories. CONGRATS LOVE U GUYS!!! Awww…so cute! Those two pictures of you together at the end are gorgeous! And that was a brilliant plan by G with the ‘tourist’ photographer. Yay you guys!! I’m so happy Jan took those shots – they’re my fave! Congrats!!! That’s such an awesome proposal 🙂 Andy & I met in person for the first time in Prague, so the city holds a special place in my heart too. Love the engagement photos! Awwww congrats you guys!! What a great story! I love that last photo! And the photographer ploy and, well, just all of it. Congratulations again! Can’t wait to see what you come up with for a wedding! LOVE LOVE LOVE! As a wedding photog I still don’t get tired of these! This is beyond precious. This story is perfection. I pinned one of the photos too. They are too good not to!! xoxo CONGRATS! You’re too sweet. Thanks for the pin and congrats! Love Love it!! How romantic! Congrats Gerard and Q!! AWWW! You two are the cutest! A big congrats to you both! AHHHHH! I love this! Congrats, you two!!!!!! Good job, Gerard! Good Job G! Way to pull the trigger and put pressure on all the remaining guys who haven’t put it a ring on it! Safe travels back home! How lovely! I’m so happy for you both. Reading this made me tear cause knowing you both and how your usually not all mushy with each other, this is like a perfect love story…can’t wait to see the rest of your “Happily Ever After” unfold. Congrats to you both! X’s & O’s from me and my lil family back home. Wow! That picture on the cobblestone street, beneath the lighted Autumn leaves: that is an amazing photograph! Congratulations again! It’s even more touching to read both of your stories on it. Gerard, great way to set it up man. Jan is the man for helping you with it and I love the idea of acting like he couldn’t get the right picture and switching to his camera. Perfectly planned fellas. I don’t try to act like I am super tough. On the real, I might have gulped at the end and held back a happy tear. LOVE IT! Congratulations you two love birds! Congrats – such a cute story. So, now all you have to do is live up to this proposal with a wedding of epically romantic proportions!! I’m thinking, medieval Hungarian castle?? All the best to you both, at any rate! Love this!!! 🙂 congrats to you both! Awesome story! Top marks to Gerard for the idea and planning – he’s set the bar high for all future travel blogging couple proposals! Good call on the photographer! I made sure we had one too and it was best. Congratulations!! So happy for you guys! Yes, Steph and I are lucky to have such smart bfs.. I mean fiancé! Good job! 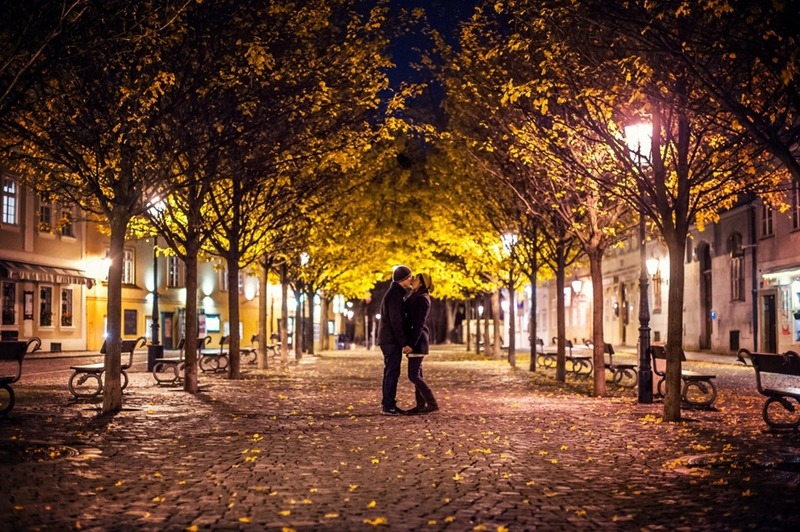 Prague IS soo romantic! Can’t believe how empty the bridge was in these photos…we were just there and it was constantly packed!! I got goosies as I read your stories. How romantic! Your journey has just begun whether it be in miles or memories. 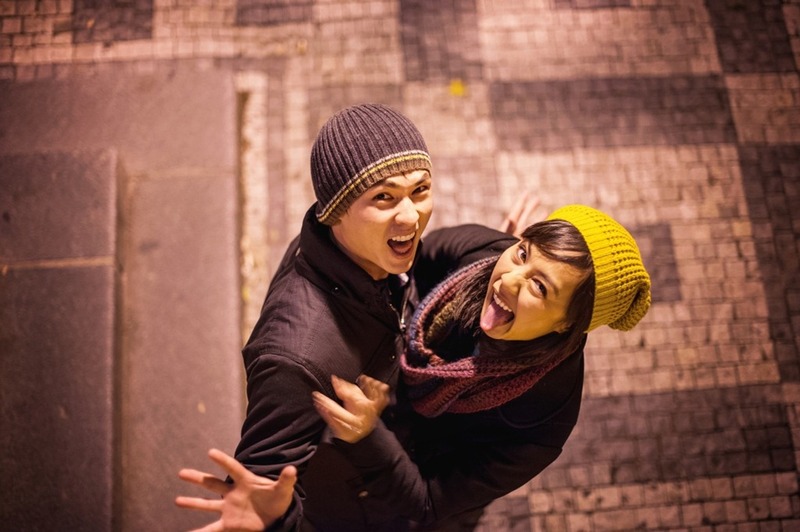 Love your blog, love the engagement story, and love the photos! Congrats!! Love this! What an awesome idea to get a photographer ahead of time!!! Smart, smart man!!! Congratulations to you! What a sweet story – reading it brought tears to my eyes! Congratulations!!! 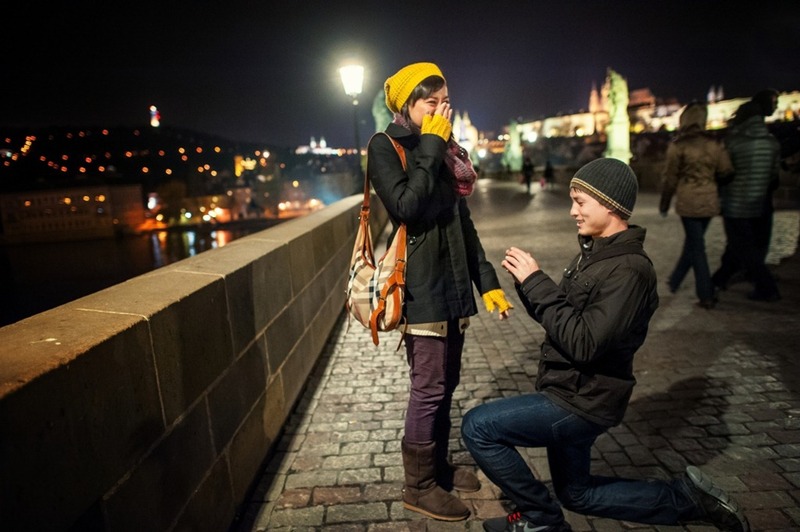 What a cute proposal… the only problem is you two are running out of new places to honeymoon! On his knee and everything..so romantic! BIG congrats to you both. So exciting, and I can’t think of a more romantic place to do it than Prague at night. Here’s to you both and the world that (still) awaits you. Anyway, I just saw that you’re in LjubIjana and the next place that you’re going to visit is the Bled Lake. It’s a fantastic place…I live in Trieste, it’s about 2 hours by train from LjubIjana. If you want to take a ride here make me know! Huge congrats guys, such a lovely story and you have those beautiful photos now to remember it by. Great job G! Congrats! What a great story, I love the sneaky photographer part, what an excellent idea. 🙂 All the best! 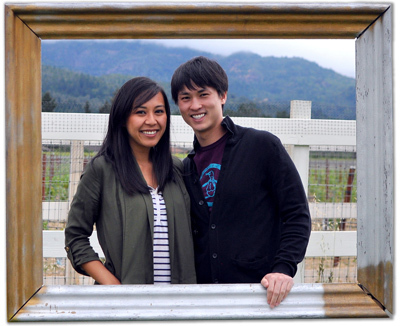 Wow – congratulations Kieu and Gerard!! Thanks so much for sharing with us your lovely engagement story! So happy and excited for you both! Wishing you two a lifetime of love, laughter and magical moments! Congratulations to you both. I know how you must have felt G. I had the situation all planned out when I proposed. It was sunset at Uluru (Ayers Rock) – the only issue was we couldn’t escape the hoards of people. So I decided to give it a try sunrise the next morning. It was freezing cold and I rushed her away from the other tourists to a small trail with a view of the sunrise… got on one knee… fumbled some words out while Lisette balled her eyes out…. then got the response “Are you serious?” (followed by a big YES). Not quite what I was expecting but it was purely from shock she said later. Enjoy the rest of your trip and we look forward to celebrating with you when you are back in SF. haha.. good on you to go sunrise. I was worried about the hoards of tourists too. But we got lucky since it was off-season.. So you can actually see some of the bridge at least! Congratulations, you two! What a beautiful story, and all the best for the future! Great story! One of the funnest blog posts I’ve read – congrats and kudos to G on all that planning! Thanks! And who would this ‘guest’ be? Seriously cried reading that this morning before work. This holiday, I am so thankful for love and friendship. It has been awhile but I hope you guys are doing great! so so so lovely! many congratulations!! I got the chills reading your accounts of the proposal. And that last photo is so perfect & romantic! Congratulations again. What a fun story! Congratulations! Congratulations and what a great story! this is the best travel blogger proposal I have read and I am greatly inspired. Congratulations to both of you and the world will more inspired by the couple we fondly read through and share their life’s travels 🙂 Cheers from the Philippines! How perfect! Congratulations you two. The Charles Bridge at night is certainly a romantic spot for an engagement. =) lucky me to have met during your year. I hope I’m invited to the wedding! Congrats you two…what an awesome story to last a lifetime! Congratulations!!! Enjoyed reading the engagement story! This is the first time in months I’ve visited your page and I’m totally regretting not subscribing to your blog! You’re too sweet.. Thanks for the congrats and revisiting guys! A little late but congratulations. Hope you both have years of happiness, good health, and travel ahead. AWESOME, awesome, awesome! Congratulations you guys! 🙂 What a great story. *HUGS*! Looks like you 2 tripped and fell… in love. Yeah, corny but I couldn’t resist the play on trippin. Prague is a stunning place for such an act. Smart man! Haha. Nice pun. Thanks Maria! Congrats you two. This is my first intro to your blog, so it’s great to read about the love story and backstory before getting into other posts. You two look too cute, auguri, as they say in Italy! Super congrats to you both! That last photo is STUNNING! And way to go G – what a super guy you snagged Q! The photographer, the bridge, the poses -EXCELLENT! But I wonder – when DID G have time to buy a ring and NOT have you notice??? Wow, such a perfect place for a proposal! I find Charles Bridge very romantic too, actually Prague as a whole. Congratulations to both of you and wish you decades of happy travels together! I don’t even know you guys but i am balling! What a wonderful story, congratulations! Congratulations! I can only hope to be lucky like you two and travel with my significant other in the future. You guys are truly an inspiration and I can’t wait to embark on my own adventure. Thank you for blogging about your travels. Please keep it up! Aww, thanks so much for your kind words. We’ll try our best. Best of luck on your own adventures! Hey cuz, I’m a bit late to the party but wanted to say congrats! Just found the blog yesterday so I guess I better catch up! I needed something new to read anyways. Love your blog – keep bloggin! Awww such a beautiful proposal! Good on you Gerard! Wish I read this earlier, would have congratulated you guys in person. Hope to see you the next time Im in California. Congrats once again! Thanks Nellie! Hope to see YOU in Grenada! Love this…congrats on your engagement and now your marriage! Congrats!! I am so happy for you two – you seem like such a great match 😀 – and the fact that you were in love with my motherland enough to want to get engaged there. (Now I want to, too!) Beautiful story and photos. Congrats to you both!